US-backed Syrian fighters cleared explosives in the last area taken from Isil and arrested several militants, a day after declaring the end of the extremists' caliphate. The US-led coalition said the clearing operations will continue until the area is secure. A spokesman for the Kurdish-led Syrian Democratic Forces said Baghouz village where the militants made their final stand was "full of all kinds of explosives". He said SDF forces had detonated land mines and suicide belts left behind by the militants. The Kurdish Hawar News Agency reported that during the combing SDF forces arrested a number of militants found hiding in tunnels. Other activist groups monitoring the area reported limited clashes between militants and SDF fighters. 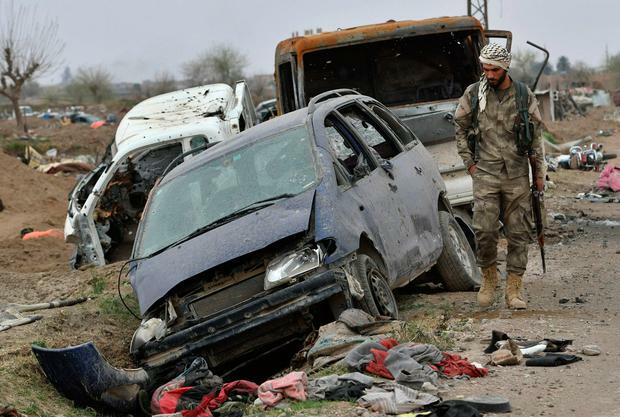 A day earlier, a Syrian driver working with NBC News reporters was killed by an explosive device that went off in a house used by the SDF as a command post and a media centre for journalists covering the fighting in Baghouz. The victory announced in Baghouz on Saturday marks the end of a devastating five-year campaign by an array of forces to retake territories held by Isil in Syria and Iraq. At its height, Isil controlled a sprawling self-declared caliphate between the two countries that was home to some eight million people. The campaign against the group came at a staggering cost, with entire neighbourhoods and towns destroyed in both countries. Thousands of civilians are believed to have been killed by Isil during its brutal reign as well as the air and ground operations by the coalition and allied troops. Watchdog groups continue to document the casualties. Meanwhile, the SDF said 11,000 of its fighters were killed in the fight. The militants were holding hostages and had detained civilians, the fate of many also remains unknown. Despite the territorial defeat, the militants have reverted to insurgent tactics and continue to carry out attacks in areas liberated months or even years ago. An unknown number of fighters slipped into Syrian and Iraqi towns and villages, forming the backbone of the new insurgency. Jonathan Spicer THE leader of Turkey's main opposition party was attacked at a soldier's funeral in Ankara before security guards led him away, in the latest fallout from contested local elections three weeks ago. Independent.ie Newsdesk Gunmen in Pakistan have ambushed a bus and killed 14 passengers after forcing them off the vehicle in the country's south-west, an official said.